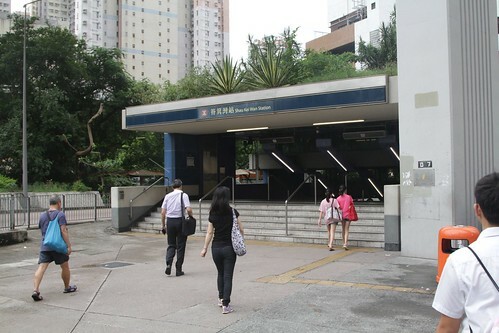 You will find MTR station entrances all across Hong Kong – but there is one important thing that all of these have in common – a way to keep floodwaters out. When entrances reach ground level, whether in the middle of the street, or tucked between shops, the easiest way to keep water out is to elevate the entrance, with pedestrians having to climb a short flight of stairs before descending into the station. But when a MTR station is directly connected to the basement of neighbouring buildings, this isn’t always possible. The solution – massive waterproof doors. Over at the Gwulo: Old Hong Kong website someone noticed a set at North Point station. My first assumption was that there might have been a bank on the other side and this could have been a vault’s door, but then I realised that the lock is apparently on the MTR side, not on the shop’s side. Does anyone know the story of that door? With another contributor providing the story behind them. The MTR confirmed that the door is a “a flood gate which is in place to prevent possible flooding situation”. Come to think of it it is logical: other entrances are under MTR’s supervision and control, and are at ground level (plus the usual few steps); in case of flooding, the MTR can quickly reinforce them… but if McDonalds fails to contain the water they will get flooded up to the ceiling. The MTR needs to protect themselves from that risk, thus the door. Wong Tai Sin exit D2 is the same situation: the exit is underground and leads to a mall that is not an MTR mall. The door limits the MTR’s risk at their doorstep literally. Flooding caused by a burst water pipe is bad enough – as seen at South Horizons and Sai Ying Pun MTR stations in 2017 – but a typhoon could cause far more damage, as the storm surge that hit the New York Subway in 2012 showed. This entry was posted in Transport and tagged Hong Kong, Mass Transit Railway, MTR, mystery, rail operations. Bookmark the permalink.